The Office of Equity, Diversity and Inclusion (EDI) is comprised of several teams. Collectively, these teams are responsible for realizing EDI’s mission to build equity for all. Uncertain about what we do and why? 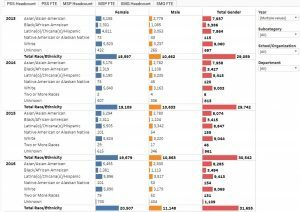 Why not take a quick look at our Implicit Bias videos, Search Committee Resources, and Free Speech FAQ to judge for yourself. EDI is led by Vice Chancellor Jerry Kang who is Distinguished Professor of Law, Distinguished Professor of Asian American Studies, and holds the inaugural Korea Times – Hankook Ilbo Endowed Chair. The Discrimination Prevention Office (“DPO”) investigates claims made by any member of the community (e.g., students, staff, and faculty) that a faculty member discriminated against them. In certain cases, DPO investigates discrimination claims against entities and individuals who are not faculty. DPO also writes policy and holds trainings on decreasing bias and preventing discrimination. The Title IX Office is responsible for UCLA’s compliance with Title IX, including the policies and procedures to prevent and respond to gender discrimination, sexual harassment, and sexual violence. The Title IX Office investigates all such claims filed against any member of the campus community. BruinX is the Research & Development arm of EDI. BruinX is an internal, multi-disciplinary think tank, dedicated to translating the best evidence and theory into practical, on the ground solutions that promote equal learning and working environments for all at UCLA. Distributed throughout the University, Equity Advisors leverage their direct experience with local culture and climate to advise their deans in terms of strategy, policy, training, climate, and accountability. Although Equity Advisors report directly to their deans, they also work closely with and provide invaluable advice to the Vice Chancellor for Equity, Diversity and Inclusion. Equity Advisors constitute an essential advisory council for EDI. The Student Advisory Board is a group of undergraduate, graduate, and professional students who leverage their unique perspectives to successfully tackle issues of equity, diversity, and inclusion. SAB members are not representatives of particular student organizations or constituencies; rather, they represent and reflect the entire UCLA student body.